Group CEO Alexander S. Friedman said: “Our 2016 earnings were disappointing on two fronts: we recorded net outflows for the year and realised very low performance fees. We are addressing both issues through our strategic initiatives, many of which have started to bear fruit, while our unrelenting focus on cost discipline is showing results. It is clear to us that sustainable long-term growth cannot be achieved through cost savings alone. We are fully focused on improving investment performance, continuing to offer differentiated products that meet our clients’ changing needs and bolstering our global distribution capability – all while maintaining strict cost control and improving operating efficiencies. GAM announced today an agreement with Julius Baer to terminate its licence to use Julius Baer trademarks to market investment funds. The company had entered into the agreement, under which it paid Julius Baer a revenue-based licence fee, at the date of the separation from Julius Baer in 2009 to support its transition into an independent pure-play global asset management group. The termination agreement includes a one-time payment by Julius Baer of CHF 4.15 million and the waiver of approximately CHF 9.6 million in licence fees otherwise payable by GAM for the period from the beginning of the fourth quarter 2015 to the end of 2016. These amounts are reflected in GAM’s 2016 financial results, benefitting net other income under IFRS and net management fees and commissions, respectively. A transition period has been agreed to allow for the orderly rebranding of funds in 2017, during which no licence fees will be payable. At the end of 2016, GAM had approximately CHF 24 billion in Julius Baer branded funds and does not expect client flows to be materially affected by the rebranding given that such funds are not sold directly into retail channels, but through sophisticated intermediaries that evaluate products based more on their track records than branding. Net fee and commission income fell 21% to CHF 473.5 million, mainly as a result of significantly lower performance fees. Net management fees and commissions declined 9% to CHF 470.5 million. This was driven by lower average assets under management and a 1.0 basis point reduction in the management fee margin in investment management to 63.6 basis points, reflecting fluctuations in the mix of net flows across products and client segments, in particular outflows from higher-margin absolute return products, which were partly offset by a reduction in commission expenses as a result of the agreement with Julius Baer as explained above. Performance fees fell to CHF 3.0 million from CHF 82.8 million. Over the previous five years, performance fees on average contributed 12% of total net fee and commission income. The mix of multiple and diverse products eligible for performance fees has generally provided a good offset between strategies surpassing their high-water mark performance levels and those underperforming. The strategies that were the most significant contributors to performance fees in the past, struggled to exceed their high-water marks in 2016 amid irrational and highly correlated markets. Net other income, which includes the net interest result, the impact of foreign exchange movements, net gains or losses on seed capital investments and hedging as well as fund-related fees and service charges, increased by CHF 4.4 million to CHF 5.1 million in 2016. This was mainly driven by net gains from foreign exchange movements versus losses in the previous year. Personnel expenses decreased 15% to CHF 246.2 million. Variable compensation was 28% lower compared with 2015 as both discretionary and contractual bonuses were reduced. Fixed personnel costs were 6% lower, driven by a decrease in staff levels from 1,074 to 979 as at 31 December 2016 (including the addition of 64 full-time equivalents through the acquisitions of THS and Cantab). The compensation ratio increased to 52.0% from 48.3%, as the decrease in total personnel expenses only partly offset the decline in net fee and commission income. General expenses decreased 2% to CHF 102.9 million. The figures in 2016 included for the first time administration expenses, amounting to CHF 6.1 million and reflecting fees paid to State Street for the outsourced fund administration and middle office services. Excluding these costs, general expenses decreased 8%, driven by lower IT and occupancy costs as well as a decrease in other general expenses. The underlying pre-tax profit of CHF 120.1 million in 2016 was 39% lower than in 2015. While costs were managed tightly and variable compensation reduced 28%, the decrease in net fee and commission income could not be entirely offset. The underlying effective tax rate increased to 21.5% from 19.9%, reflecting a change in the geographical split of earnings and share-based payment expenses being non-tax-deductible in certain jurisdictions. Diluted underlying earnings per share of CHF 0.60 were down from CHF 0.98, driven by the decline in underlying net profit and slightly mitigated by the benefit of the reduction in the number of shares outstanding from the Group’s share buy-back activity. The IFRS net profit of CHF 134.3 million, all attributable to the shareholders of GAM Holding AG, fell by 3%. The IFRS figure includes two items that are not reflected in the underlying results – non-recurring items that resulted in a net gain of CHF 30.0 million and acquisition-related items that resulted in a net gain of CHF 10.1 million (all net of taxes). The former include the recognition of deferred tax assets related to the merger of certain Swiss legal entities, a credit arising from changes to the Swiss pension plan to ensure its long-term financial stability, and a one-time payment from Julius Baer for the termination of the licence agreement, partly offset by reorganisation costs and deal and integration expenses. Acquisition-related items include a reduction in the estimate of the deferred consideration liability for previous acquisitions, mainly Arkos (now GAM Lugano), partly offset by the amortisation of investment management and client contracts from businesses acquired and finance charges on the deferred consideration liabilities. Investment management recorded net outflows of CHF 10.7 billion in 2016 amid clients’ heightened risk aversion as a result of political and economic uncertainty. Assets under management fell to CHF 68.2 billion from CHF 72.3 billion, as the addition of CHF 6.2 billion of assets through the acquisitions of THS and Cantab and CHF 0.4 billion in net gains from market and foreign exchange movements partly offset the outflows. In absolute return, net outflows totalled CHF 5.7 billion. The JB Absolute Return Europe fund, which takes long and short positions in equities and equity-related securities of European companies, and the GAM Star Global Rates fund saw redemptions amid weak performance in 2016, while outflows from the unconstrained/absolute return bond strategy slowed markedly in the second half of 2016 as performance improved. The new GAM Star (Lux) – Merger Arbitrage fund attracted strong inflows, as did some institutional mandates. In fixed income, net inflows totalled CHF 1.1 billion in 2016. GAM Star Credit Opportunities fund, which predominantly invests in investment grade debt or high quality issuers, the JB Local Emerging Bond Fund, which invests in debt of emerging countries denominated or pegged to the respective local currency, as well as the new trade finance offering attracted solid inflows. Specialised products, such as GAM Star Cat Bond and GAM Star MBS Total Return funds, also continued to attract inflows. Equity strategies suffered redemptions amid record outflows for the asset class across the industry, with outflows largely driven by the JB Japan and GAM Star China Equity funds due to negative sentiment toward these sectors. On the other hand, GAM UK Diversified, JB Emerging Equity Fund and GAM Star Continental European fund attracted net inflows. Net outflows from equity strategies totalled CHF 3.3 billion in 2016. In systematic strategies, Cantab’s Core Macro and Quantitative Fund programmes saw small redemptions in the fourth quarter. 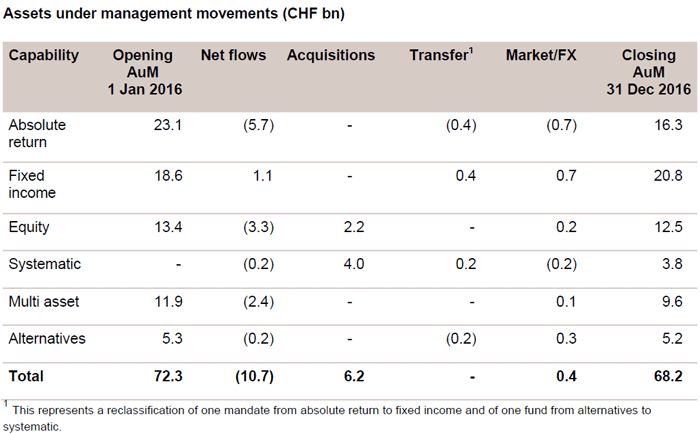 Multi asset strategies had net outflows of CHF 2.4 billion for the year. Net inflows into risk rated solutions for financial advisers were more than offset by redemptions in private client advisory and mandates stemming from GAM’s previous affiliation with UBS and Julius Baer as well as some low-margin institutional mandates. Net outflows from alternative strategies amounted to CHF 0.2 billion as net inflows into the JB Physical Gold Fund were more than offset by redemptions in the traditional funds of hedge funds. Uncertainty and frequent bouts of volatility particularly affected flows through financial intermediaries, resulting in a net outflow of CHF 5.5 billion in 2016. Institutional clients withdrew a net CHF 3.7 billion, while net outflows from private clients of CHF 1.5 billion continued to largely reflect redemptions from GAM’s previous captive channels (UBS and Julius Baer). Over the five-year period to 31 December 2016, 68% of investment management assets in funds outperformed their respective benchmark. Over the three-year period, 60% of assets in funds outperformed as a number of strategies were affected by the difficult market environment. Excluding funds in the CHF 9.8 billion unconstrained/absolute return bond strategy, 66% of assets under management in funds outperformed their respective benchmark over the three years through December 2016. Assets under management in private labelling, which provides fund solutions for third parties, rose to CHF 52.5 billion from CHF 46.7 billion a year earlier. Net inflows amounted to CHF 4.3 billion, while market and foreign exchange movements led to a combined CHF 1.5 billion increase in assets. The Group’s cash and cash equivalents declined to CHF 352.7 million from CHF 632.9 million as at 31 December 2015, mainly reflecting the upfront payment for the Cantab acquisition, the revaluation of sterling cash balances, deferred consideration payments on previous acquisitions and net purchases of seed investments. Tangible equity decreased to CHF 107.4 million from CHF 487.0 million, driven by the goodwill and investment management and client contracts acquired with THS and Cantab, the dividend payment covering the 2015 financial year (offset by the IFRS net profit in 2016), the remeasurement of pension liabilities driven by interest rate decreases in the UK and the revaluation of sterling tangible equity. Over the course of 2016, GAM purchased 612,200 shares through the current three-year share buy-back programme that started on 28 April 2014 at an average share price of CHF 14.19, representing a total value of CHF 8.7 million. On 29 June 2016 the Group announced the decision to suspend the purchase of shares under the programme to maintain appropriate levels of capital following the acquisition of Cantab. The Board of Directors intends to put in place a new share buy-back programme after the current programme expires on 28 April 2017. The new programme will provide the Group with future flexibility to return excess capital to shareholders once capital buffers are rebuilt and in the absence of other opportunities for investment. At the upcoming Annual General Meeting of GAM Holding AG on 27 April 2017, the Board of Directors will propose a dividend of CHF 0.65 per share for the 2016 financial year, unchanged from the previous year, representing an estimated total distribution of about CHF 102 million. This underscores the Board’s commitment to maintaining its policy of progressive, sustainable and predictable dividends, increasing in line with earnings growth through the business cycle. The dividend will be paid from capital contribution reserves and will therefore be exempt from Swiss withholding tax. A priority in the Group’s high-performance culture is continuous development of investment talent. GAM improved investment processes, risk management systems, portfolio monitoring and support functions to assist investment managers as they focus on realising the full potential of their portfolios. Individual investment teams were brought closer together, fostering an exchange of investment ideas and macroeconomic views. GAM also hired Matthew Beesley, former Head of Global Equities at Henderson, in February 2017 to a new role of Head of Equities to work together with the various equity teams to optimise performance and risk management and to ensure strong links with sales and marketing. Further improving investment performance is a top priority for the Group in 2017 and beyond. The Group made good progress toward broadening its innovative product range in 2016. GAM hired Roberto Bottoli, a well-recognised specialist in his area, to launch a merger arbitrage fund and also launched two trade finance investment solutions, adding to its private market offering. The acquisition of THS, a UK-based global equity investment firm known for its successful thematic bottom-up and benchmark-agnostic approach, added a number of experienced equity investors to the Group. The launch of GAM Systematic, following the acquisition of Cantab in October 2016, allowed the Group to expand and diversify its active investment capabilities into the systematic space – a segment with growing investor demand, where returns show low correlation to traditional asset classes. Cantab is renowned for its rigorous scientific research and multi-strategy approach to systematic investment, with its state-of-the-art infrastructure and proprietary technology allowing the team to run a suite of models across more than 150 macro markets and a universe of over 2,500 equities. GAM Systematic already launched two new UCITS funds, based on Cantab’s proven methodology and tested investment strategies. The acquisition of Cantab will be highly accretive to GAM’s earnings from the first full year of ownership. In addition to establishing GAM Systematic as a leading provider of quantitative investments, the product development priorities for 2017 include broadening GAM’s offering across the credit spectrum, private market strategies and equity capabilities. As of 1 January 2017 distribution, marketing and product development are led by Tim Rainsford, previously Global Co-Head of Sales and Marketing at Man Group. Tim Rainsford has already made a number of important hires to strengthen the Group’s sales organisation and is conducting a full review of distribution capabilities to ensure the company is aligned for growth in each of its core markets. In February 2017, GAM created a new team focused on global investment consultants and hired Greg Clerkson as the Head of Global Consultant Relations. The Group is expanding distribution presence in continental Europe to gain better traction in core client segments. GAM received regulatory approval in early 2017 to have on-the-ground presence in Vienna and is seeking regulatory approval for presence in Paris. In the UK, the company plans to launch a number of its existing strategies in the form of UK Open Ended Investment Companies (OEICs) in response to demand from financial intermediaries and advisers. The Group achieved cost savings well in excess of plan in 2016, reducing fixed staff costs and general expenses (excluding the impact from acquisitions of THS and Cantab) by about CHF 16 million from 2015, compared with CHF 9 million in planned savings as communicated with half-year results. GAM will continue to make all its operations as efficient as possible and expects to reduce fixed staff costs and general expenses (excluding the impact from acquisitions of THS and Cantab in 2017) by CHF 30 million through 2019 from the 2016 cost base. In the second half of 2015, GAM began implementing a new operating model to drive efficiencies and reduce its cost base. As part of the new operating model, the company is outsourcing administrative activities to State Street, which provides fund accounting and middle office services for our products. GAM is also developing a comprehensive and effective data management platform to simplify internal processing and systems and to enable more sophisticated reporting and management information tools, ultimately leading to greater future efficiencies. GAM continued to simplify its product range to concentrate on the most promising and scalable strategies. In 2016 the company merged or closed 25 funds in addition to 41 funds in the previous year, with a de minimis loss of assets under management. This process will continue in 2017, ensuring the offering remains relevant and lean across different product cycles, guided by a strong emphasis on innovation. The market environment will continue to be affected by political uncertainty in 2017. The longer-term impacts from policies being implemented by US President Donald Trump are yet unclear. Elections in the Netherlands, France and Germany this year will test the era of centrist policies in Europe, while the UK government is progressing on the difficult process of exiting from the European Union. The key concern for 2017 is whether politics will undermine generally improving economic fundamentals. For now, the market environment appears favourable for a continuation of the broad trends observed since mid-2016: higher global bond yields, underpinned by resilient economic growth and normalising monetary policies, and rotation away from traditional fixed income allocations toward equities, absolute return products as well as emerging markets. Dispersion of returns within markets is likely to become more pronounced, providing richer opportunities for selected absolute return and active management styles, positioning GAM well to capture investor demand in these areas. The presentation for media, analysts and investors on the GAM Holding AG results for 2016 will be webcast on 2 March 2017 at 9 am (CET). Materials related to the results (Annual Report 2016, presentation slides and press release) are available at www.gam.com.